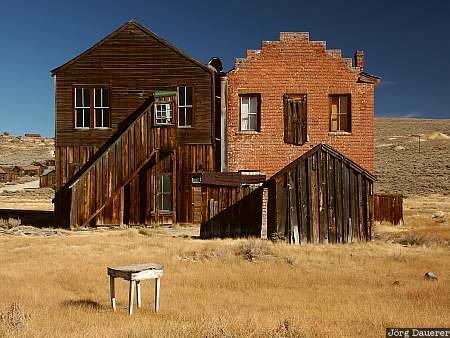 An old desk in front of two ruins in the ghost-town of Bodie. Bodie is in the eastern Sierra of California in the west of the United States. This photo was taken on a sunny afternoon in early October of 2002. This photo is part of the exhibition Rust, Wrecks and Ruins (February 2014). This photo was taken with a digital camera.